The team wore 10 sets of jerseys in the 2006-07 season and 3 of them were 1 game only promotional games. 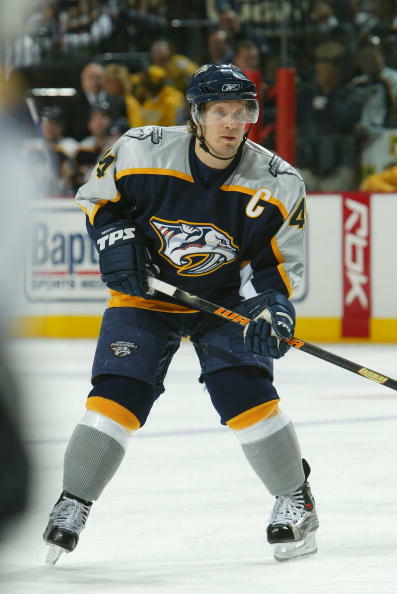 Kevin wore this jersey only in the preseason as he played in just 3 games for the Predators in 2006-07. Very light wear with just a few visible stick marks on the sleeves. This goalie cut alternate has lots of pucks and stick marks and tons of pilling in the neck. A great jersey from the Predators all time winningest goalie. David wore this awesome alternate during it's last season used by the team. It has fairly light wear but does have a lot of stick marks on the upper sleeves. A little bit of pilling. Steve's alternate jersey has nice wear with stick marks on the front and some scuffs on the sleeves. The jersey also has a custom shortened fight strap and is an amazingly small size 50! Chris' set 2 jersey has great wear with post paint transfer on the sleeves and a repair below the crest. Puck marks on the front and sleeves. This jersey from Kimmo has great wear with 9 repairs and a few unrepaired holes. It also has his standard custom shortened sleves as well as marks on the front and back. You can't have enough of his jerseys! This set 2 jersey worn by J.P. has nice wear with many stick marks across the front and sleeves. There is a large cluster repair on the left sleeve as well as an extremely unique pilling pattern. The team wore a set of home 1 game promotional jerseys for Opening Night on October 5, 2006. The team wore a set of home 1 game promotional jerseys with the Garth Brooks patch for a game on January 6, 2007. The team wore a set of alternate 1 game promotional jerseys for "Shirt Off Their Back" Night on February 10, 2007.